a haven for fresh ingredients made into healthy and luscious meals! Feeding a Crowd and Want the Wow Factor? 3 words: Giant Peach Pancake! This easy, low fat pancake is a frequent go-to in the kitchen. 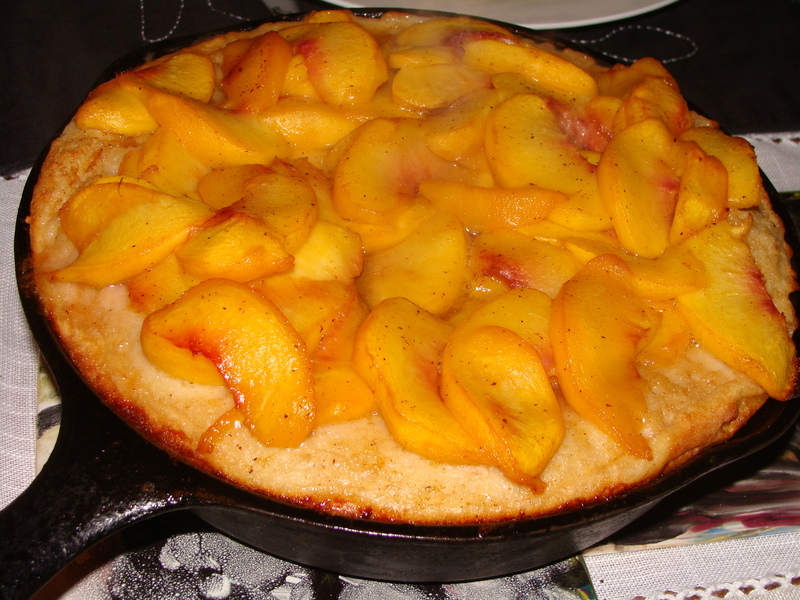 The ingredients are simple: fresh fruit (this one uses peaches but I love it with apples, sour cherries and also apricots), a few eggs, milk, and a bit of flour. It’s quick and glamourous! Only stipulation is that the crowd must be sitting with forks raised when this masterpiece emerges from the oven. Like a soufflé, the pancake rises with heat and loses its loft once it’s out of the oven, so eat it up fast! Somehow, this is never a problem at my house!!! Heat oven to 425 degrees F (220 C). In a food processor or with electric mixer, beat eggs for a few minutes, add milk and vanilla. A bit at a time, add the flour, blending continuously as the flour is added. The mixture should be smooth but not over beaten! Place a large cast iron or other skillet or a couple of smaller ones, into the oven and melt butter in the skillet. Pour the batter into a hot skillet and bake on bottom shelf for 10-15 minutes. Remember that crowd of brunch guests have to be ready, waiting and eager as the pancake will settle the instant it emerges from its hot oven. No fear. The drama of the moment when this giant pancake graces the table, is well worth assembling an audience and preparing for the inevitable applause.